Combine all ingredients, taste and adjust seasonings. Chill until serving or serve at room temperature. Using mortar and pestle, crush lavender seeds with citrus zest, herbs, and black pepper. In large mixing bowl, combine olives with crushed seasonings, olive oil, and juice. Transfer to large cast iron skillet or glass/ceramic baking dish. Roast for approximately 20 minutes, stirring occasionally. Olives will brown slightly; do not over-roast. Remove olives from pan with slotted spoon; keep seasonings if you’d like to make my foccacia - sooo good! Cool olives slightly before serving; refrigerate to store. Place walnuts in food processor fitted with metal blade; pulse until finely ground. If mix is too thick, continue pulsing while adding more olive oil in thin stream. Taste and adjust seasoning with salt and any other ingredient you desire, including pepper for more heat. Sift flours with salt, place in large mixing bowl. Combine yeast well with water, add oil. Pour onto flour mound, mix with clean hands until dough is manageable and can be formed into a soft ball. Add flour or water as needed; to get this perfectly may take practice, but this recipe works very well for basic proportions. Remove dough from bowl, and “oil” bowl generously with olive oil. Place ball in center of bowl, cover bowl with plastic wrap and allow to rise until doubled, in draft-free space for at least one hour. Using pan or skillet from roasted olives - or well-oiled pizza pan/cast iron skillet/flat baking surface, transfer risen dough into pan for baking. Allow a “second rise” if time allows, about 30-60 minutes, then preheat oven to 450F. Place pan in center of oven, and bake for 20 minutes or until lightly browned on top. Bread is ready when it can be easily lifted from its pan and is browned on the bottom; increment baking times by about 3 minutes until done. Let cool slightly before cutting into squares or wedges. Combine lemon zest, juice, vinegar, mustard, sugar, salt in large bowl or blender jar. Whisk by hand - or blend - until smooth. Whisk in oil in thin stream to create emulsion, or add oil slowly to blender to emulsify, for smooth, creamy dressing. Taste and adjust seasoning with more sugar and/or salt, for desired flavor. 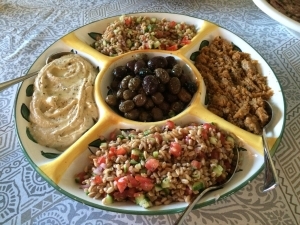 Prepare platter with farro salad, crumbled feta, hummus, walnut dip, olives ... drizzle everything lightly with lemon vinaigrette, and finish with dried Greek oregano, crushed with fingers, for the perfect final touch. Offer warm pita and foccacia on side as accompaniments. My very favorite mecca of inspiration is the Getty Villa in Malibu. It’s one of my favorite places on the planet to relax, recharge and, I swear, to revisit past lives in ancient Rome and Greece. 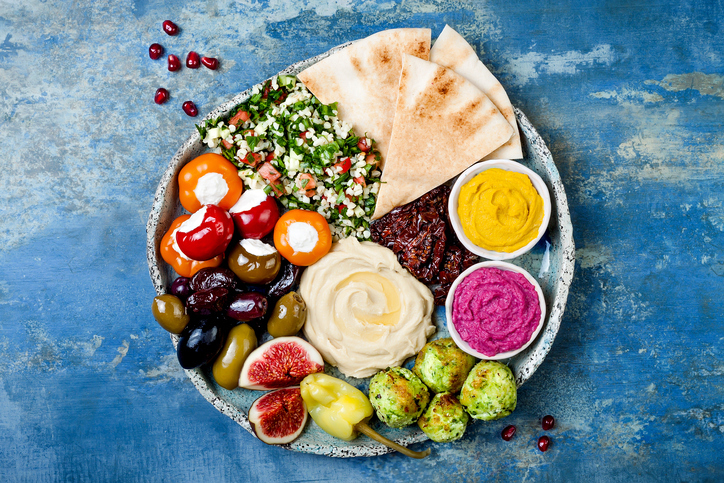 Mediterranean is very much my specialty in the kitchen and at the table, especially dominant influences from Italy, Greece, Spain, France, and even North Africa. I’ve been told it’s because I lived there over and again, and that’s where I learned to cook before this life. In this story you are the benefactor of that ..
Not only do I feel like I’ve had an entire’s day vacation (to Europe) upon each visit at the Villa - even if it’s for just a few hours - I adore a respite and meal at the Cafe’, and a shop in the gift store. By now, my recipe repertoire has expanded for that experience. My collection of jewelry, books, writing papers, art supplies is also better for that shopping and come to think of it, they also have an amazing pomegranate bar soap that is irresistible! The first time I had the Cafe’s Mezes Platter for lunch was on a day when I was still at BarComida and I needed serious self-nurturing; this meal hit the spot. I also imagined that I could recreate it with my own touch, for my own menu so, I did. To rave reviews! At the moment, it’s one of the main offerings on my “cold platters” selection, for parties that I cater. With warm pita and my focaccia as mops, it gets cleaned up pretty quickly. My plate (foto above) often includes a Spicy Walnut Dip; I use Trader Joe’s hummus since I know and love the private labeler! My foccacia is always on the side so I’ve provided that recipe here too; also for my lemon vinaigrette which finishes the platter. *hearty grain believed to be a mainstay of an ancient Roman’s daily diet.